Visiting relatives, or going home for the holidays or a special occasion? Give the gift of free tech support! There’s a good chance that if you’re a regular reader here, you’re also the regular family tech support guy/gal too. Now that you’re visiting the family for the holidays, take some time to get onto their computer(s), tidy up their Mac, run a few updates, and do some basic maintenance. They’ll be grateful for your help, and you’ll be thankful that some preventative maintenance now may reduce those tech support calls and emails later in the coming year. We’re obviously focusing on the Mac and OS X here, but we’ve thrown some Windows tips in at the bottom for good measure too. Let’s face it, almost everyone puts off system updates. But they’re important to install because they bring new features, bug fixes, and security improvements, so this should be the first thing you do. Sometimes this requires a reboot, particularly if it’s a full fledged OS X update. 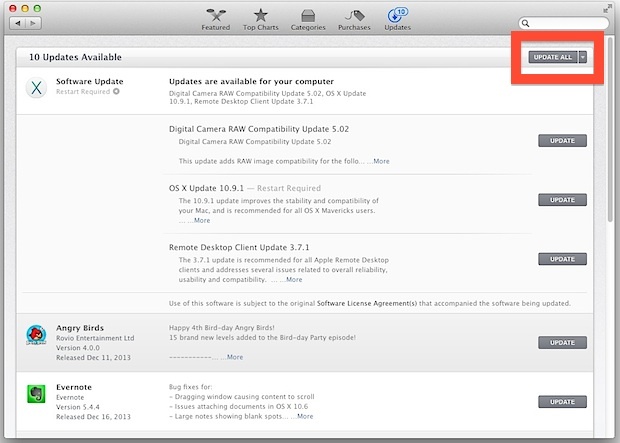 If the computer hasn’t been updated in a very long time, you may need to do this one or two times after the Mac has rebooted to install all available updates. This may tie into tip #2 as well, depending on the version of OS X. If you can do it all through the App Store, perfect. Apps that are outside of the App Store may need to be updated manually, but every app is different. Safari is great and it should be updated in the above sequence, which typically will improve it’s functionality and stability. With that said, if they have any complaints about Safari, or they need to use the Flash Player often, then consider downloading Chrome. Chrome often has better performance in general when a lot of tabs or windows are open, but that is particularly true with Flash Player (which is built in and sandboxed separately). Chrome and Firefox are both free and great web browsers. Sometimes just installing an alternate browser is enough for the tech support phone calls to end. By the way, if they have a Windows PC, consider installing Chrome and/or Firefox to be essential. 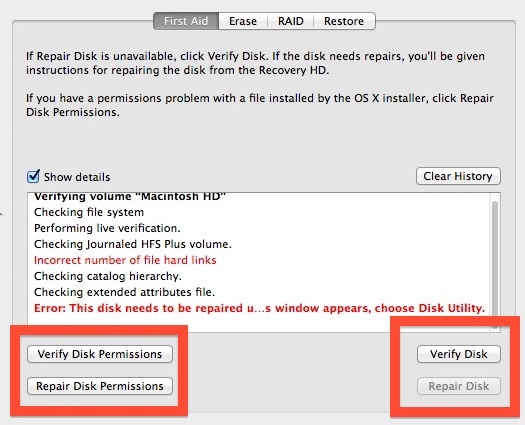 Note that if you need to repair the startup disk, you can boot into Recovery Mode by holding Option during system start, then selecting the recovery partition and running Disk Utility again from there. You can read more about this process here. Be forewarned that if Disk Utility can not repair the drive problems, the disk itself may be going bad. If that’s the case, get the computer backed up ASAP so nobody loses any important files, pictures, or documents. If the family Mac has an older version of OS X installed, consider upgrading the entire thing to the latest version of OS X Mavericks. We say “maybe” because you should only do this if you can make a backup of the hard drive first, and if you know for certain they aren’t going to lose out on any app compatibility, since there is nothing more frustrating than losing access to some apps. This is usually not an issue with Lion and Mountain Lion users, but those lingering around on Snow Leopard still may be there for a reason. As we all know, Windows is really a different world, and with so many versions around it’s hard to give precise instructions for everyone so just keep it simple: install updates, get a safer web browser, defrag to clean up the hard drive, and… recommend they jump to the wonderful world of Apple. Is this a Google Chrome commercial? Safari and Chrome are good browsers. Firefox is clunky and bloated. Internet Explorer is internet explorer. Could you back up your statement with a link to some recent figures about browser clunkyness and bloat, and maybe you got some about HTML/CSS render accuracy as well (I think that’s so annoying when a modern browser lines up the pixels all wrong)? Or were you talking visual design, like the guy who once told me he bought a G4 instead of a Windows machine, because it looked so good — under his desk? Jan: I have to concur with your critic, my preference is Safari, Firefox and Chrome I deleted from the machine. Firefox is very well developed the best third party extension support by far, the only reason Safari wins out is integration with Mac OS/iCloud. Chrome, I think its popular because its “cool”, and fast, but, I like to save web passwords and Chrome (when it does save, its pretty buggy), does so in plain text. Not cool. Yeah, defrag is important, but OS X hFs+ is more efficient than fat32/ntfs. Its = belonging to it. Really nice tips. I do have to say that the Chrome pitch is a little distracting. Safari is a great browser in its own terms. If it is a PC, Piriform’s Defraggler is pretty good. Probably most importantly you should get them a backup drive and set up Time Machine to use it. Windows 7 and onward defrag automatically. Manually scheduling defrags is a waste of time and purchasing/installing 3rd party applications is a waste of both time and money. For an SSD, defragging is of no need. OS X’s file system doesn’t require a defrag. Yeah?! How do you know? Then why are the system and backup HDDs so fragmented and slow? I’m glad that you pointed out being up-to-date on the most recent system updates for your computer. Being up-to-date with the software can make your computer run so much more smooth. In my opinion, you should have a professional looking at your computer at least once a year to clean it out.